The words “ethical”, “quality” and “welcoming” are what probably best describes Label Etoffes. 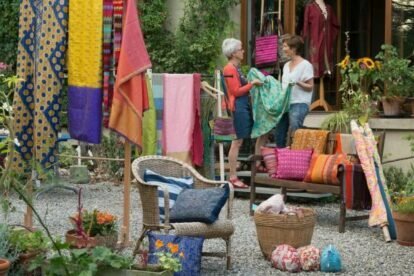 It offers an amazing selection of scarves, tablecloths, accessories and jewellery made of fabric. The items come from all over the world, mainly from fair-trade associations that Inge, the owner of the shop, has personally visited. Inge welcomes you in her open-on-request shop or during one of its monthly events in her nice private house. She is always delighted to share the story or the technique of a fabric with you, served with a cup of spicy tea. The items are so beautiful that you will probably want to buy all of them. Fortunately the prices reflect the quality and the fair origin of the products, thus you will probably have to make choices. Label Etoffes opens the eyes to how rare it is to find high quality in homemade fabrics works, such as outstanding embroidery. Every piece is unique; so, if you fall in love with an item, I highly recommend you buy it. After hesitating a while I bought a splendid cushion made by an Indian artist; now, every time I go to my living room I cannot help but admire it.